That is not to say that running in the evening or lifting in the morning isn’t a good idea! Exercising at any time during the day is always going to be beneficial and worth the effort. However, if you are undecided as to what is the best time for you to train, then here are some of the advantages to either morning or evening training for you to consider. Start your day off on the right foot – Exercise pumps your body full of endorphins and stimulates the production of serotonin so that you are feeling good and ready to take on the world! Less likely to find excuses – If you exercise first thing in the morning, it is a lot easier to maintain the routine as you are less likely to have obstacles of the day come in the way. You might be the kind of person who will come up with excuses as to why you should sleep in a little longer instead, however, if you can break past that, morning workout schedules are often more likely to be followed. Increase your metabolism – Working out before you eat is an excellent way of boosting your metabolism so that you can efficiently metabolise your food and rapidly burn through calories for the rest of the day. Make healthier breakfast choices – When you start your day off on a healthy note, you will often find that the rest of your day follows suit. You are more likely to make a healthy breakfast choice after a morning workout. More space and freedom – If you plan to workout before 8 am, then chances are that you will avoid the crowds, whether it be at your local gym, or on your favourite jogging track. You are going to be stronger and more flexible – First thing in the morning, your body is still waking up and your muscles have been relatively still all evening, so your strength and flexibility will be at a low. Which is why evening training gives you the advantage of having your body warmer and more prepared for the training you have planned. Less likely to fill your time with unhealthy activities – After a busy day of work or other responsibilities, it can be tempting to go out for drinks, or laze about in front of the television. 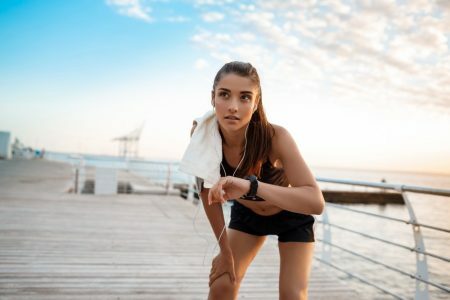 Yet when you choose to finish your day off with a workout you avoid less healthy choices, and are also taking the time to reconnect with your body and your healthy attitude. Great way to release any stress from the day – Some days are more stressful than others, and on these days I find an evening training session to be the best way to release any built up tension or frustration. Leaving you nice and relaxed for bedtime. This helps to physically exhaust you ready for an evening of sleep – evening training session actually warms the body temperature which is conducive to deep and restful sleep. So when it comes down to the question of morning or evening training, it is really about finding what works best for you. You may struggle getting up early in the morning, or you may have children or work responsibilities that take priority first thing in the day, or vice versa. It doesn’t really matter what time of the day you choose to train, just that you make the time to do it. In my experience, most people work best when they select a time and try to stick with it. Because consistency breeds habit and having a regular workout time is a good habit to get into!